This is the Milligan - Harty House, a two family worker's house, nearly identical to the West wing of the Visitors Center which houses the Museum. 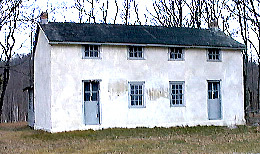 It was constructed as worker's housing around the outbreak of the Civil War in 1861. It is of simple stone rubble construction with a basic lime and river sand mortar. This building was worked on in 1995, when state funding stabilized several buildings and structures in the park. A new roof was put on and the walls repaired in the original style. The interior still has the original layout with a wall down the middle and a second floor with 2 bedrooms on either side. We hope to restore and refinish the interior and open the house to visitors where they will be able to see the simple lifestyle of working class families here in the ironworks.